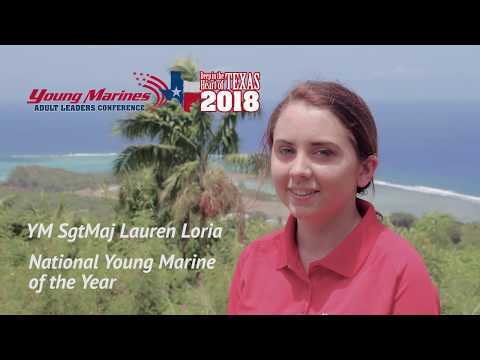 The Young Marines, a national youth organization, announced the 2018 - 2019 National Young Marine of the Year – YM SgtMaj Lauren Loria, 17, of Fairfax, Virginia. She is a member of the Col. Wesley Fox Young Marines in Sterling, Virginia. Loria is a senior at Chantilly High School. She represented Division 2, competing with five other Division Young Marines of the Year for the title of National Young Marine of the Year which was announced at the annual Adult Leaders’ Conference for Young Marines held Saturday, May 12, 2018, in San Antonio, Texas. Loria joined the Young Marines the day she turned eight and is now in her ninth year in the program. She has faced many more challenges than her peers including being without a home while in the 4th and 5th grade. After Loria had spent some time in the program, she developed a passion for teaching other Young Marines and being a part of a team. Last March, as Division 2 Young Marine of the Year, Loria escorted WWII veterans to the annual Reunion of Honor trip to Guam and Iwo Jima. Loria received the Commendation of Merit for an outstanding job as 1st Sgt. during Division 2's Frozen Chosen. She also earned a Distinguished Order of Merit for completing a two-year bench dedication project, now located in Eleanor C. Lawrence Park, in honor of Col Wesley Fox. In addition, Loria has been entered in the Congressional Record for her numerous community service hours. Outside of Young Marines, Loria plays soccer and enjoys working on cars. In addition, she paints and spends time with her iguana, Hugo. Her goals after high school are to apply for a motorsports scholarship to the University of Northwestern Ohio where she will earn a bachelor's degree in automotive technology for high performance vehicles and later, transfer to the Universal Technical Institute in California to get a certificate in Auto Collision. As National Young Marine of the Year, Loria will travel throughout the country representing the Young Marines, and she will be a mentor to the 9,000 youth members of the organization. “I am very excited to meet Young Marines from all across the country,” she said. “I want to make a lasting impact. I want to show them all the opportunities that the Young Marines give. I would also like to inspire the female Young Marines that this is as much a girls’ club as a boys’ club. Even if I only inspire one Young Marine, I will consider my mission a success.